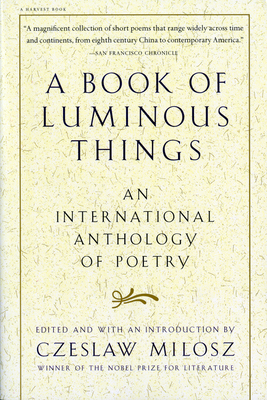 Czesław Miłosz's A Book of Luminous Things—his personal selection of poems from the past and present—is a testament to the stunning varieties of human experience, offered up so that we may see the myriad ways that experience can be shared in words and images. Miłosz provides a preface to each of these poems, divided into thematic (and often beguiling) sections, such as “Travel,” “History,” and “The Secret of a Thing,” that make the reading as instructional as it is inspirational and remind us how powerfully poetry can touch our minds and hearts. " Czeslaw Milosz (1911-2004) was born in Lithuania. During the Second World War he was active in the Resistance in Poland and later served in the Polish diplomatic corps. A poet, translator, essayist and novelist, he was awarded the Nobel Prize for Literature in 1980.